In America’s fastest-recovering cities, increasing numbers of families are finding themselves without a place to call home. Donnell Harris’ story begins like those of so many other victims of the recession. In 2011, with the national economy slowly recovering but unemployment still near its peak, the 32-year-old Washington, D.C. resident lost his security job amid widespread layoffs at his company. Harris, his wife and their two children were evicted from their apartment in the working-class neighborhood of Anacostia. For a couple of years, they bounced between friends and relatives who were willing to put them up. Then, in February 2014, a friend they were staying with was himself evicted. With nighttime temperatures in the District falling into the single digits, they had nowhere else to go. Unfortunately for the Harrises, they became homeless at the wrong time. Through the end of January, D.C. experienced an unprecedented spike in family homelessness, with the number of families placed in shelters more than double what it had been the previous winter. Its shelters filled to capacity, the city started placing families in motels in D.C. and Maryland. Soon there were 10 times more homeless people living in motels than there had been a year earlier, and those rooms ran out too. So when the Harrises arrived at the Virginia Williams Family Resource Center, where families apply for shelter, they were placed not in a standard shelter or motel room, but in a small, partitioned space on the basketball court of a recreation center. The makeshift space offered little privacy and no shower, and each day the Harrises were forced to make a daily trek to Virginia Williams to re-apply for a cot for the next night. The practice came to an end in March, when a judge found that the use of these rec centers violated city law and ordered the District to move the families to private rooms until the spring thaw set in, at which point the families would be left to fend for themselves. The timing of D.C.’s spike in family homelessness this winter might seem counterintuitive. After all, the recession officially ended five years ago, and the economy has been growing and unemployment declining — slowly, sputteringly, but unmistakably. And yet, since the recession’s end, the family homelessness crisis has only intensified. 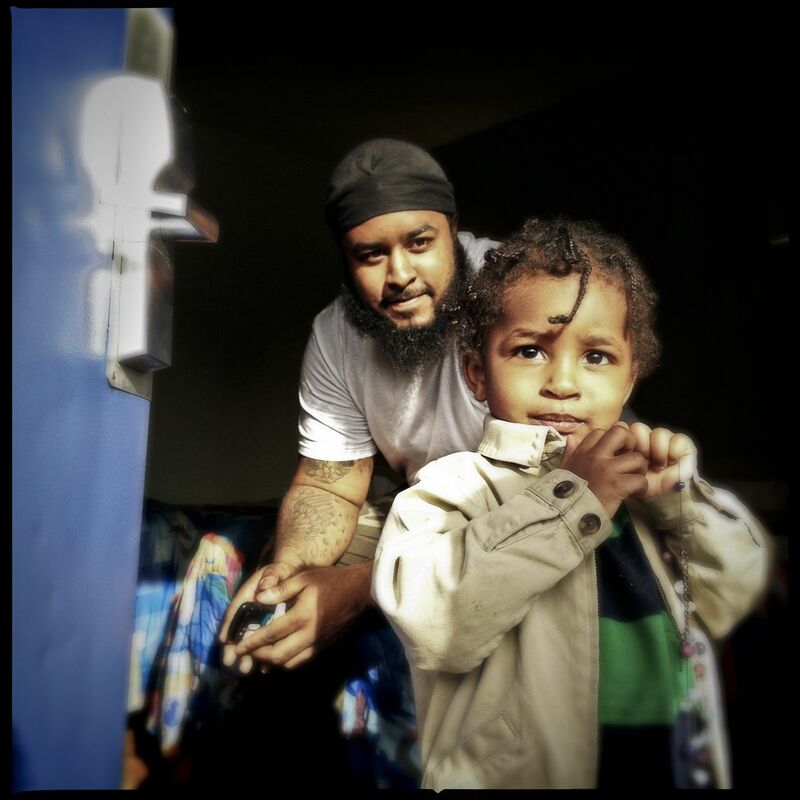 Between 2010 and 2013, the number of homeless families in D.C. increased by 23 percent, according to the U.S. Department of Housing and Urban Development. The District is hardly alone in this regard. Across the country, major cities have experienced a sharp increase in family homelessness over the past few years. In Los Angeles, the number of homeless families increased by 21 percent between 2010 and 2013. In Boston, it was up 23 percent. In San Francisco, it rose by 29 percent. In San Diego, it more than tripled. Unlike chronic homelessness, family homelessness is often hidden. Its victims aren’t out on the street, but live doubled up with friends or relatives, or in cars or public buildings. And perhaps more than any other type of homelessness, it’s carried by macroeconomic tides, meaning that even as the wave of economic growth carries some Americans back to prosperity, low-income families can find themselves particularly vulnerable to an undertow caused by shifts in the housing and job markets. Even the statistics can be ambiguous. There’s actually some question as to whether family homelessness in the country overall has gone up or down in recent years. U.S. Department of Education data show the number of homeless children attending public schools increasing steadily, from about 940,000 in the 2009-2010 school year to nearly 1.2 million in 2011-2012. By contrast, HUD’s annual point-in-time count — a measure criticized in some corners for counting only homeless people on the street and in shelters on one particular night — recorded an 11 percent decline in the number of homeless families between 2010 and 2013. Nonetheless, even the HUD count makes clear that in the cities with the most expensive housing, the number of homeless families is on the rise, often strikingly so. One measure of housing cost is the S&P/Case-Shiller Home Price Indices. The cities with the highest housing cost in last year’s index were Washington, D.C., Los Angeles, San Diego, New York, Miami, Boston and San Francisco. All experienced an increase in family homelessness between 2010 and 2013 in the HUD point-in-time count. Another way to measure housing costs is by the balance between rent and income. According to an April study for The New York Times by the real estate website Zillow, the cities with the highest ratio of median rent to median gross income are Los Angeles; Miami; College Station, Texas; Santa Cruz; San Diego; San Francisco; and Salinas, California. The point-in-time count showed an increase in the number of homeless families in all of these cities.The boundaries of these jurisdictions don’t always line up perfectly — the Case-Shiller index refers to metropolitan areas, while the Zillow study concerns cities, and the HUD count varies — but the trend is indisputable. At its core, the cause of rising family homelessness is simple: Homes, for these families, have grown unaffordable. Yet the problem has been excruciatingly complex, and America’s wealthiest cities are the ones that have struggled the most to solve it, creating a crisis of unseen proportions even as the national economy is supposedly on the rise. As a significant national phenomenon, family homelessness is a relatively new problem. It was only during the recession of the early 1980s, when overall homelessness began its rapid ascent, that families with children became homeless in substantial numbers. A 1986 congressional report found that the number of homeless families, previously a “negligible portion of the overall homeless population,” had grown through the first half of the decade to constitute 28 percent of the country’s homeless residents. Foscarinis cites Ronald Reagan-era cuts to social welfare programs and public housing as one cause of endemic family homelessness. The ’80s also brought a sharp rise in income inequality, with real incomes for poorer Americans dropping in the first half of the decade, even as housing costs continued to rise, making it more difficult for many families to afford homes. This divergence between incomes and rents has replicated itself in recent years. A December report from Harvard’s Joint Center for Housing Studies found that rents in America stayed relatively flat in real dollars through the 1990s, before rising 6 percent between 2000 and 2012. In the latter time period, the median real income of American renters declined by 13 percent. As a consequence, the study concluded, a full 50 percent of renters are now in homes they can’t afford, defined by the federal standard that puts the maximum affordable housing cost at 30 percent of income. That’s up from 38 percent of renters who were spending more than 30 percent of their income on rent in 2000. Meanwhile, the percentage spending more than half their income, a so-called severe cost burden, jumped from 19 percent to 27 percent. Harris is among them. He’d never been homeless before, but his struggle exemplifies the surprising pattern of increasing family homelessness during a period of economic growth. The delayed reaction to the recession makes sense, considering the route families like the Harrises take. Many lost their jobs and their homes at the economic nadir, then stayed with friends and relatives for a couple of years. Now they’ve exhausted their fallbacks and are finally seeking shelter. At the same time, the cost of housing, which dropped in some cities during the recession, has climbed steadily since — creating a shortage of the affordable housing that could help families avoid homelessness in the first place. In cities like D.C. that weren’t hit as severely by the recession and didn’t see housing markets crash, the crisis is especially dire. A report by the D.C. Fiscal Policy Institute found that the city lost more than half its units renting for less than $750 a month last decade. No one knows that better than those working to find housing for those who desperately need it. Alameda County has managed something remarkable: In the midst of a recession and a national homelessness epidemic, it has shrunk its homeless population by nearly one-fifth. Overall homelessness in Alameda declined by 16 percent between 2003 and 2013. In that time, the share of the homeless population made up of families went from more than half to less than a third, and the number of people in homeless families dropped from 2,246 to 1,342. It’s not that Alameda is a cheap place to live. Occupying the east side of the San Francisco Bay, it’s home to cities that have been pricey for a while, like Berkeley, and cities that are becoming more expensive, like Oakland. And yet, as the high-cost jurisdictions up and down the California coast struggle with rising family homelessness, Alameda has brought its numbers down. What’s its secret? A combination of a family focus and targeted programming. Alameda’s program follows a model that’s been adopted by an increasing number of jurisdictions around the country over the past five years. President Obama’s 2009 stimulus package included $1.5 billion for the Homelessness Prevention and Rapid Re-Housing Program, or HPRP. Cities and states quickly began using this funding to implement their own rapid rehousing programs. Rapid rehousing departs from the older model of homeless assistance, which placed people into long-term housing only after they’d received treatment and support services for issues like drug and alcohol addiction and mental illness. Under rapid rehousing, providers take the opposite approach, following the housing-first philosophy that states that stable housing is a key ingredient for rehabilitation. There are good reasons to push families directly into private housing. Living in shelters can be destabilizing: Children suffer at school, and parents struggle to find work and plan for the future. Moving families quickly into apartments can help them get their lives in order. Down the coast from Alameda, in San Diego County, the largest homeless family service provider has taken a very different approach. North County Solutions for Change begins by addressing a family’s personal and economic challenges and only then places the family into long-term housing. Violet Bombolo is among the people Solutions for Change has helped. She and her husband were living paycheck to paycheck until he was laid off and they were evicted from their San Diego County home last June. With disaster seemingly striking all around, a tree also fell on their truck and totaled it. They collected the insurance money and bought an RV. They parked the RV in a church parking lot, where they had no electricity, just a stove and toilet. But with two children, it was no way to live. They lasted all of four days before turning to Solutions for Change. Bombolo and her family stayed in the shelter for 96 days. They’re now living in a transitional apartment while she begins a job search. Solutions for Change President Chris Megison argues that his program’s approach avoids the pitfalls of the rapid rehousing model, which quickly places families into housing but doesn’t immediately address the root problem. As a result, he says, children can end up in new housing with drug-addicted parents, and the parents’ struggles are passed on to the next generation. But Roman says that if a city is pursuing rapid rehousing without providing concurrent support services, it’s simply doing a bad job of implementing a good program. “The data does not indicate that more people return to shelter from rapid rehousing than from transitional housing,” she says. “In fact, the opposite is true.” A HUD study of the first two years of HPRP found that nearly 85 percent of rapid rehousing participants stayed in permanent housing when the subsidy ended. Still, a well-structured program to move homeless families into housing can only do so much if a city’s housing is unaffordable to many residents. Of America’s high-cost cities, San Diego is the one that saw the biggest jump in family homelessness between 2010 and 2013 in the HUD count. According to Megison, that count is actually under-representing the severity of the problem. One likely factor, she says, is the high cost of housing in San Diego. The rental vacancy rate in the county, she points out, is less than 3 percent, pushing rents up and making it harder for low-income residents to find homes they can afford. That makes homelessness mitigation more challenging for the local government. Rapid rehousing tends to be a more cost-effective approach, since it limits the length of the housing subsidy, but jurisdictions that employ it are also running into the wall of high housing costs. That’s because local governments using rapid rehousing won’t place homeless families into apartments they won’t eventually be able to afford on their own, and with the supply of affordable housing dwindling in many cities, these apartments are hard to come by. In D.C., the city’s director of human services said last year, there was a need to move about 100 families into rapid rehousing each month, and yet the city struggled to place more than 40 families a month. It’s not that the city lacks the funds; it ended fiscal year 2013 with a surplus of more than $300 million. It’s just that the city government can’t locate enough affordable apartments. The loss of affordable housing has been compounded by the fact that the economic recovery hasn’t benefited everyone evenly. The problem? Nobody’s doing it. Long-term subsidies are expensive to sustain and, in today’s up-by-your-bootstraps political environment, difficult to marshal support for. Instead, the most obvious way to reduce family homelessness is to create more affordable housing, and several cities have recently announced initiatives to do so. Last year, D.C. Mayor Vincent C. Gray promised a one-time, $100 million investment in affordable housing, which he hoped to renew in subsequent years. In May, New York Mayor Bill de Blasio unveiled a 10-year plan to use $8.2 billion in city money — in addition to private, state and federal funds — to build or preserve 200,000 affordable housing units. De Blasio has also reinstated the priority given to homeless residents for public housing — something revoked under the previous administration of Michael Bloomberg — and forced developers of some residential buildings to include affordable units for low-income New Yorkers. In cities with the most expensive housing, the number of homeless families is on the rise, often strikingly so. Family homelessness is a new problem for the U.S.. The growth of our low-wage service economy has aggravated the problem; there are millions of working Americans who can’t afford to pay rent in the cities they call home. One promising strategy for solving the problem is a rapid rehousing policy that guides local governments to place homeless families directly into market-rate apartments instead of putting them in temporary shelters. The local government subsidizes their rent for a limited time, after which they pay their own way. On a recent Saturday morning, the McDonald’s at the corner of Grand Concourse and East 151st Street in the South Bronx is hopping. Mothers and children pack the place, shouting to be heard over the din. Siobhan Lee and her 14-year-old daughter Tatiana sit among the crowd, sharing an order of fries.They’ve just come from an anonymous-looking seven-story building a block up East 151st Street, toting a rolling suitcase bearing the pink word “Love” and a duffel to match. So have the majority of the other McDonald’s customers. “I saw most of these people in there,” Siobhan says. On all other days, economic activity radiates out from the modern building from which the Lees emerged, its facade ablaze with an attractive array of red and orange terra-cotta tiles. It’s known as PATH, or the Prevention Assistance and Temporary Housing Center. The building is New York City’s intake center for homeless families seeking shelter. Mothers and children make their way up its ramp in a steady stream, at a rate of a family every minute or two — and Saturdays, says the security guard on duty, are slow. These are boom times for the city’s family homeless services, and for the nearby businesses that benefit from spillover traffic. The number of homeless families in New York City has soared in the aftermath of the nationwide recession. In just the three years from January 2011 to January 2014, it climbed from fewer than 10,000 to an all-time high of 12,724, according to the Coalition for the Homeless. The number of homeless children topped 20,000 for the first time in 2012 and now stands at a record of close to 23,000. Siobhan lost her job as a certified nursing assistant about four years ago and fell behind on rent at her Bronx apartment. She and her daughter left before they got evicted and went to stay with Tatiana’s uncle. But the living situation wasn’t sustainable, so they had gone to PATH to seek shelter. Back at the center, another mother and daughter make their way up the building’s ramp. Nicole Lumpkin wheels a large red suitcase behind her, with a backpack and a duffel over her shoulder. Two-year-old Navia has her hands full with two dolls, each nearly as big as she. Unlike the Lees, they’re not there to seek shelter, but rather to check out with the city’s social services. “We’re leaving the state,” says Nicole. 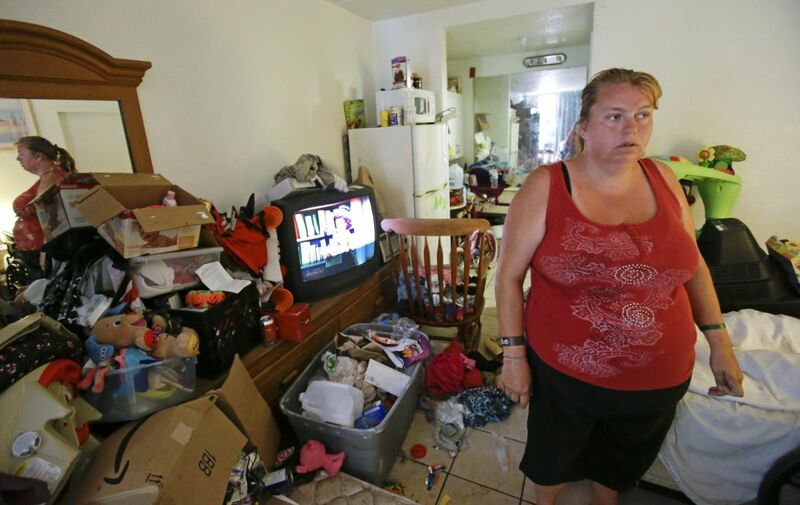 After state budget cuts in 2011 forced New York City to terminate its Advantage housing subsidy program, the Lumpkins could no longer afford the $1,070 rent for their one-bedroom apartment, and they were evicted. They stayed with a friend in Brooklyn, until that friend was also evicted. So they went to PATH and got placed in a shelter in the Bronx. But Nicole says she wasn’t getting the help she needed at the shelter, so she and her daughter left after six months to stay with friends. Still unable to find apartments they could afford, they decided to leave the city for Georgia, where they have acquaintances. Not every family has that option. The Lees grew up in the Bronx; it’s where their friends and family are. Siobhan works there, and Tatiana goes to a charter school. So they came to PATH with their belongings in tow, hoping for shelter. Instead, says Siobhan, they were given a voucher for one month’s rent and a security deposit, each valued at $900. When the Lees had an apartment of their own, a one-bedroom in the northeast section of the Bronx, they were paying $1,095 a month — and rents have only gone up since then. Siobhan says the voucher and the part-time work she’s resumed as a certified nursing assistant and personal trainer might be enough to cover rent, but wouldn’t leave enough for other expenses. When I catch up with Harris recently, he’s in good spirits. He has recently landed a job at a local supermarket — something he was unable to do while staying at the recreation center because of the need to reapply for shelter every day, a process that often took half the day. His boss at work has been increasing his hours for the part-time job, and he expects to be pulling in a true living soon. A meager living, but a living nonetheless. He’s also started taking classes at the University of the District of Columbia. On the housing front, however, he has no good news to report. He’s been approved for rapid rehousing for a while, but he’s been unable to locate any viable apartments. Partly, it’s because they cost more than he’ll be able to afford when the subsidy runs out, and more than the city will allow. Partly, it’s because landlords aren’t familiar with the program and grow suspicious when they learn that the subsidy is guaranteed for just four months. So he’s still homeless, and still looking. Harris is doing everything right. He’s working, he’s studying and he’s finding friends with whom his family can stay, temporarily, so they’re not on the streets. He just got caught up in the same confluence of bad events that’s trapped so many Americans: job cuts, rising housing costs and a homeless system that’s stretched to capacity. So don’t tell him people’s homelessness is their own doing. Aaron Wiener covers urban development for the Washington City Paper. He previously worked as a correspondent for the Los Angeles Times in Berlin and an editor at The Washington Independent, Talking Points Memo, and The Washington Post. He has also written for Slate, Foreign Policy, Monocle, The New Republic, and The American Prospect, among other publications.